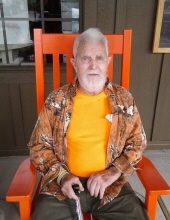 James “Jake” Grubbs, 86, passed away on Monday, April 8, 2019 at his home after a long illness. Funeral services will be held on Thursday April 11, 2019 at the Seven Pines Baptist Church at 3:00PM with Pastor Scott Saxton officiating. Burial will follow in the church cemetery, with Military Honors. Visitation will be held on Wednesday, April 10, 2019 from 6-8 pm at Mole Funeral Home. Survivors include his loving wife, Margie Kraft Grubbs of Snelling; sons, Kalvin (Mary Ellen) Grubbs and Dennis (Tammy) Grubbs of Snelling; brother, Charles (Betty) Grubbs of Snelling; sister, Irene Padgett of Beaufort; grandchildren, Emma Grubbs, Morgan Grubbs, Kristian Grubbs; great grandchild, Cohen Bryant; step grandchildren, John and Michael Seabrooke, Jeff Thomas, Timbre Stallings; step great grandchildren Blayden Bryant, Caleb Thomas, Kaiden Thomas, Blake Thomas, Emma Thomas and Charleston Pattan; special friend, Mike Davis. He was predeceased by sisters, Rose Sanders, Annie Lou Kinard and Lib Sanders and brothers, Franklin Grubbs, Leroy Grubbs Junior Grubbs and Henry Grubbs. To send flowers or a remembrance gift to the family of James "Jake" Grubbs, please visit our Tribute Store. "Email Address" would like to share the life celebration of James "Jake" Grubbs. Click on the "link" to go to share a favorite memory or leave a condolence message for the family.